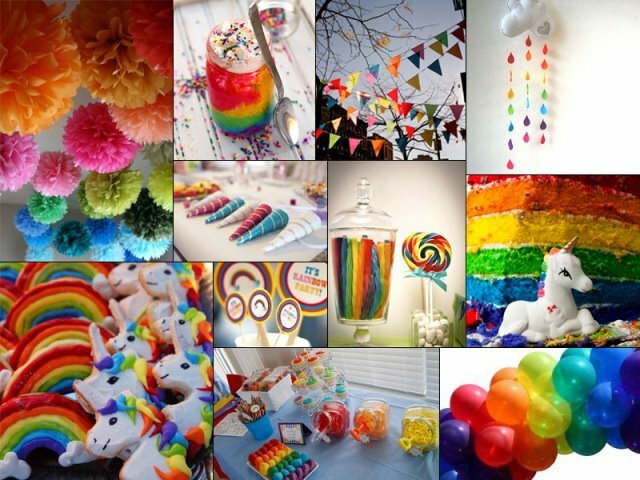 Studio 5380: It's A Rainbow Party Blog Hop! 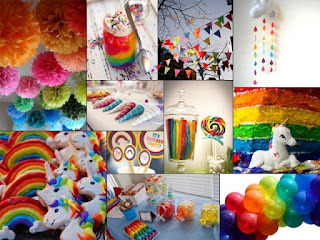 Hello everyone and welcome to the "It's A Rainbow Party" Blog Hop! ** To be eligible for these prizes, please be sure to leave a comment on each blog in the hop (and a way to contact you) before midnight (MST), August 17th. Random winners will be chosen and announced early next week at Scrappin' 2 Little Princesses. How's that for a Rainbow Party? My candy jar holds almost 6 pounds of Skittles! * The rainbow on the jar is from the "Silhouette Online Store". After putting it together, I covered the entire rainbow with Glossy Accents and sprinkled on Martha Stewart's Coarse Glitter. * The mats for the top of the jar are created with Spellbinders "Eyelet Circles"
* The sunshine is from "Peachy Keen" stamps. He also got a dose of coarse glitter. * The sweet sentiment is from the "Pink By Design" stamp set "Rain or Shine"
* I grabbed up all my twine and made a "rainbow-bow" for my candy jar. * This rainbow was also covered with Glossy Accents and sprinkled with coarse glitter. What an awesome project!!! 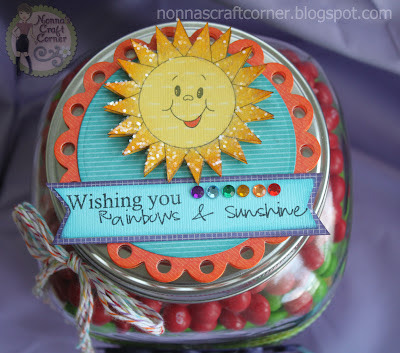 Love the rainbow jar with that adorable sun...glitter and awesome sentiment!! Thanks for sharing, so happy to be hopping with you and Happy Hump Day! What a fun rainbow set! Love it! Yummy...6 lbs. of Skittles..now you are talking...LOL! Fabulous card with the embossed clouds and love the happy little sunshine guarding the candy. Beautiful projects as usual! The skittle jar is such a great idea! Love your projects. The jar set up is great. Also love the card. Nice job. Way too much fun. Love the jar lid the most. Smiles. Hi Tanya...newest follower and glad I stopped off on this fun hop! I loved your project soooooo much, I pinned it on my board on PINTEREST!! You did an amazing job on the rainbows, clean & bright. I promise not to tell your dentist!! Please stop by and say hi, it's my 1 year Blog Anniversary and I'm giving away FREE $$$$$. Love the skittles jar! I totally can see how so many rolled right off your worktop! Skittles have to be my husbands favorite candy; he can't stop at just a handful! Gorgeous creations and loving the rainbow and the clouds. I love the decoration on the jar too. I just loved it! What a nice way of gifting candies!! And the whole project looks so bright and cheerful. The lil girls will love them. Oh I wish you could see me, I am having a fit over your projects! What a perfect gift for two little girls! I would have loved something like this when I was a little girl! Just wonderful! WOW...these are so super cute! Cute candy jar. I have a friend who was just in a car accident and I think i'm going to whip one of them up for her. WOW- 6 lbs of Skittles!! What a fantastic candy jar and I love the twine you added!! The card is absolutely perfect, too!!! Wow!! Gorgeous!!! I LOVE your jar.. I can't believe it holds that much candy LOL Wow! Its awesome! Love how you layered the colors too.. that would have been some work sorting them!! I love your card too!! The clouds are awesome with the dry embossing! 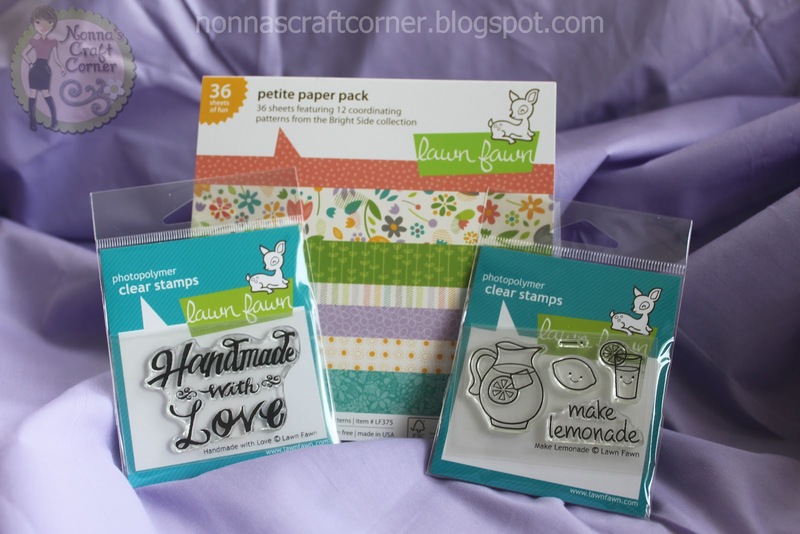 These are great project.I really love the candy jar it would b a great teacher gift also. That candy jar would be a big hit in my house!! Love the Rainbow card too. So cute! I just love it! The jar and card are so colorful and cute! I am a very happy follower of yours now. TFS! A rainbow of skittles! What 2 and 4 year old will not love that! Perfect gift! 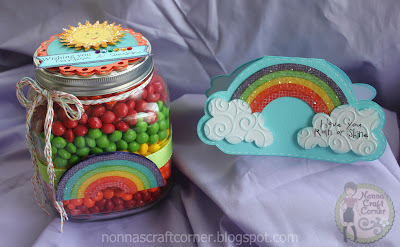 Oh that rainbow card is so cute and the candy jar is great with bright colors. I am a new follower. What a cute little jar it sure looks like a rainbow to me. Love the card with those clouds too cute. Your newest follower here. Love your jar full of rainbow sweetness. Love your shape card, too. TFS. OMG! I love the candy jar! What a fab ideal! TFS and for the extra chance to win your yummy candy. I love the paper pak. Fingers crossed. That jar is just a rainbow of fun. Such a sweet idea.6 pounds, wow! Cute card too. Oh my, love the card and treat jar! Next time you need help separating the skittles, let me know! LOL I started following your blog, thanks for the chance to win those great prizes! Tanya, What a beautiful card and candy jar. I love how you used the glitter. I don't normally use glitter but now I want to use some glitter. TFS! Oh how I LOVE skittles!! Your jar would make a great Birthday present or teachers gift. I know I would love to receive it. Great job. I just love your projects both of them, but especially the one with candy in it. Both projects are so fabulous!! Wow, that's a lot of Skittles!! I love how you separated them by color...I would have just dumped them inside :) Your way looks much better!! The jar topper and card are gorgeous!! 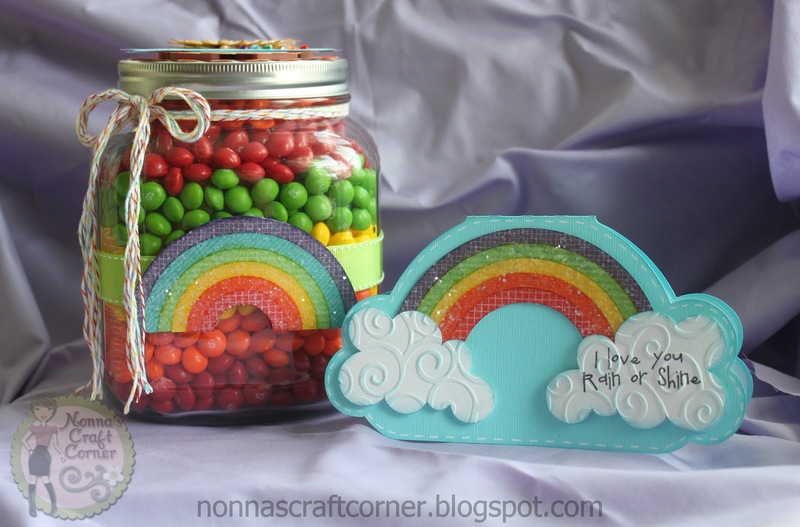 What a fun and cute candy jar and I love the shape card. So nice being in the hop with you. What a cute treat jar and card. Reminds me of the beautiful rainbow I seen last week at the park. Rainbow can always brighten your day. Fantastic! I love how you captured every little detail! The lid on the jar is gorgeous, card amazing, but my favorite thing is how you divided the colors out so that the candy was a rainbow too! Love it all! Oooh! I love your cute treat jar and beautiful card!!! :) You captured the theme perfectly!